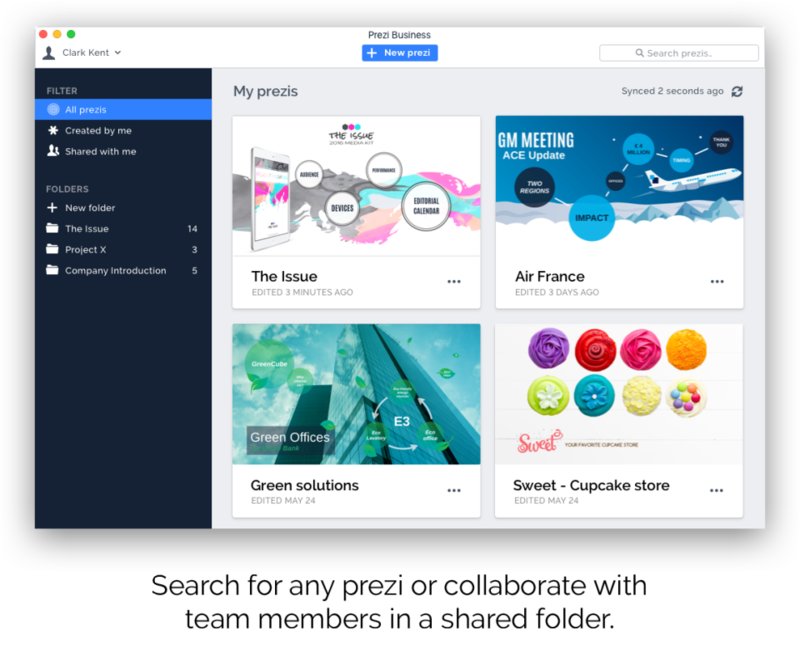 Prezi Next, the latest in presentation software from Prezi, features a dynamic, flexible format that lets you move freely between topics and adapt on the fly, without having to flip through slides. By adjusting your delivery to focus on what interests your audience most, you get people invested and engaged through a whole new style of communication we call conversational presenting. The result? More meaningful dialogues and better outcomes for speakers + audiences alike. Prezi Business Reviews Recently Reviewed! Prezi is unique, but be smart with usage! Pros: First, I want to point out that Prezi is a great platform. It feels like you're using a platformed that is inviting us into the future of presentations and slide decks. It's simple to create a fresh, dynamic slideshow - but what's great is that doesn't feel like a slideshow! The generated movement (natural zooming) almost hooks your audience and takes some of the heavy lifting off of the presenter. The ability to integrate images, documents, texts, hyperlinks, and even videos is also an incredible feature. From a creator standpoint, although there is a bit of a learning curve if your shifting from another slideshow platform, Prezi is relatively simple to learn to use. The features and layout are not overly tedious to learn to navigate. 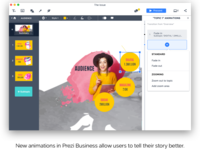 Prezi just recently added the collaboration feature, which was needed in the Google Drive era we live in. This enables users to collaborate on one dynamic show. Another high point is that they offer a free, web-based option before paying for a subscription. Last, Prezi is just different - it operates, feels, and looks unique. It's not a linear, click next, click next show - it breaks the mold! - If you over use it, then your audience will essentially see it as a slideshow. Prezi has to be used with purpose - to make a presentation pop, if that makes sense. Overuse will lead to desensitization, losing the "wow factor." - Don't try to use this last minute. As mentioned earlier, there is a learning curve involved. Not only learn to create, but learn to present it effectively. If you haven't rehearsed and practiced, and you try to lead a Prezi presentation... it could end badly. - Web-based is a pro/con - so just realize that you will not be able to use this platform if you do not have wireless access or limited WiFi. There is an export feature, though, which could help, but I do not have experience with this. - In my experience, it is important to note that some people just don't like Prezi. Audience/students complained about the animated movement and motion and preferred something more predictable and easy on the eyes. Just keep that in mind. Overall: Creating presentations that pop and have a fresh, dynamic feel. Prezi has more Power than Powerpoint! Pros: I was first introduced to Prezi in one presentation I attended at a local university. My initial impression was that it was such a powerful, engaging, visually stimulating tool for making presentations. Ever heard of "Death by Powerpoint"? Well, Prezi has some magical powers to alleviate such boredom by making slides twist, turn, zoom in/out, pop out, and see the minute to the BiG picture! Collaboration is at the heart of Prezi Business. It makes your Prezi presentations and story creation more dynamic by engaging more minds to work on the same material together. Feedback and commenting are easy via the chat feature. Teams can also work on a common/shared folder for easy access to content. 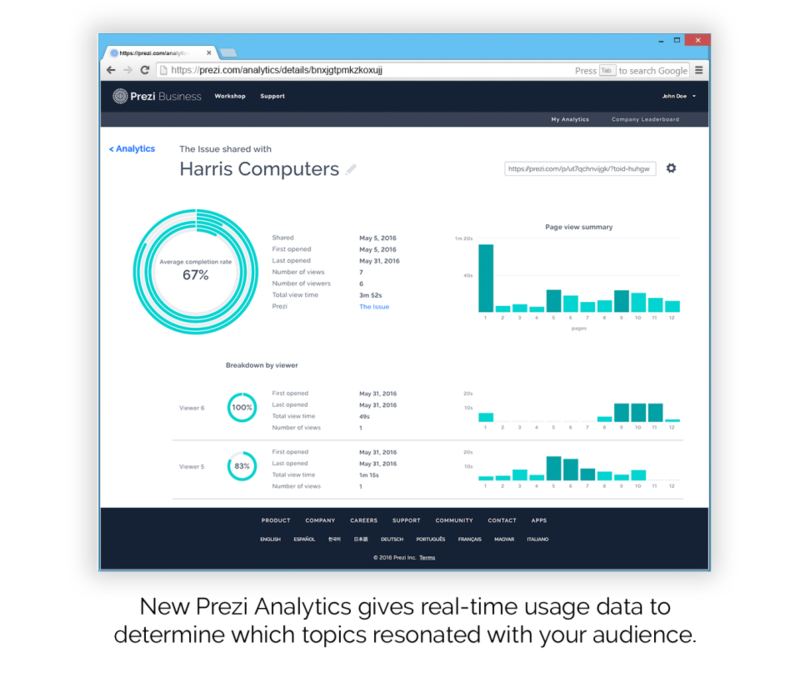 This is cloud based so we can all work together anywhere and anytime as long as we're connected to the net. At the end of the day what matters is the effectiveness of one's presentation/efforts. Prezi Business has helped our marketing team via Data Analytics. We are able to get actual data feedback on who viewed our Prezi, which parts are engaging and which parts are boring and where they tend to just skip through, etc. This feedback helps us to further improve specific parts of our storyboard, visuals, and presentations. There are many templates and sample/public Prezi's out on the Internet to be used as a reference. It can also be branded accordingly using one's corporate logo and images. Cons: Prezi is a little more difficult to explain and to train our (older) staff. Hence, it took a bit of a learning curve to grasp the tools and to fully maximize its features (esp the analytics). People got so used to PowerPoint that they initially resisted Prezi. I just wish Prezis can be downloaded or exported into an executable presentation for mobility/run-anywhere without the need for Internet access. Pros: Very useful dynamic work tool with great features easy to use and to present at meetings conferences and meetings. I like that it is a viusal dynamic tool with vast work templates. 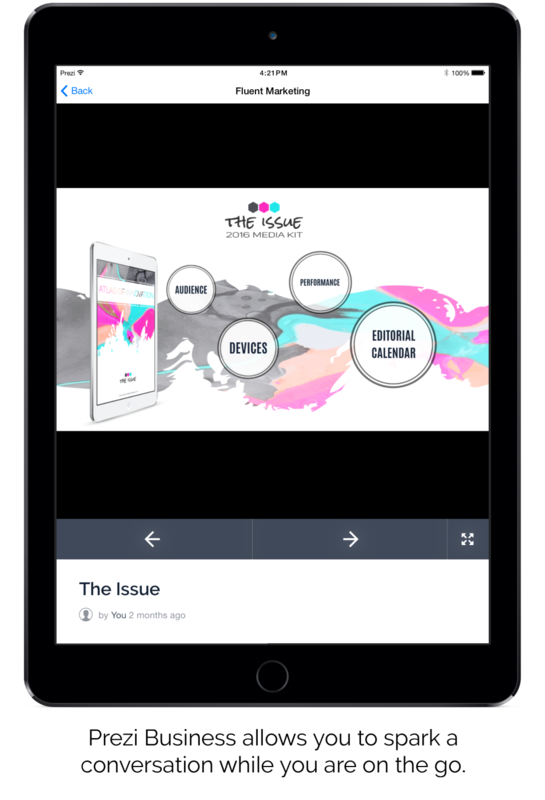 Each of these templates has an art touqe that allows to generate ideas and interactive contents with text videos, images and links. Being able to have a presentcation with this tool allows us to look good by giving an impression with the audience if a conference is about. Traditional presentations based on slides are just that: Traditional. You could have fantastic images, but no matter how elegant (or austerely minimalist) each slide is, it's still a slide. 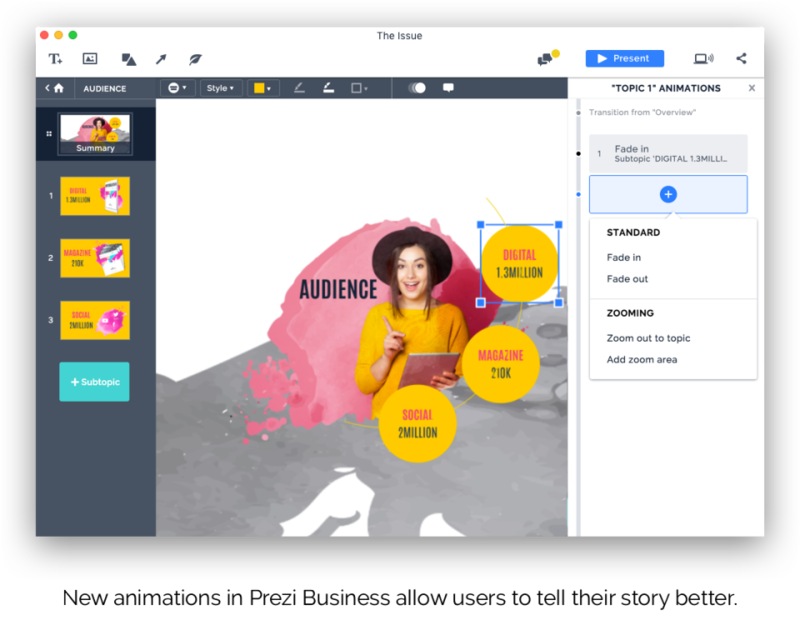 Prezi (several prices, starting at no cost) tries to change this by converting his presentation into an open canvas in which he can draw his ideas spatially and then present them by zooming and panning the entire canvas. Used well, the final result feels cinematic and interesting in a way that traditional presentations rarely are. To begin, Prezi displays a list of templates you can use. There is a large number of templates, but there is no way to preview the appearance of a template, except when starting a project with it. If you start a project with a template and discover that it does not work, after all, you can change to a different template in half, but you must adjust things to work in the new template. Cons: It is a program a bit complicated to understand at the beginning because of the multiple functions that it offers us. for the reproduction of the presentation it is necessary to have Adobe Rader, and some computers do not have this program and that can be a bit complicated with the treatment of the program. It is a program that to use the sSI presentations is necessary to use the internet. It is a program that is in the English language. It requires a certain level of knowledge to be able to use it correctly and in a practical way, like other software this is also paid and the way to use it is through an account that must be kept active paying monthly to use the software, of course that there are pirated means to make it work for free, but in general it is paid. It is a program a bit complicated to understand at the beginning because of the multiple functions that it offers us. It is a program that to create the presentations is necessary to use the Internet. Pros: Prezi is a presentation tool that breaks out of the restrictive slide format to create dynamic presentations that make use of a large canvas that the presentation moves along by sliding, scaling, or rotation the framing to. With this format, it is much easier to visualize information and how information relates to itself. This large canvas also makes seeing the bigger picture clearer compared to slides. While a programmed set of movements and framing is used to create the flow of the presentation, this flow can be broken out of any time to change the framing dynamically. This is useful if, for example, someone asks a question and changing the current framing would help answer this question. The collaboration tools and online functionality in Prezi are excellent, allowing for easy real-time changes to be made on a presentation. In addition to real-time changes, there is a chat for present collaborators and the ability to add comments to the presentation. Cons: Prezi is more difficult to use compared to more traditional presentation tool, especially if a user has trouble breaking out of the habits of using other tools. The freedoms afforded by Prezi can be a negative to delivering a presentation, as it can be distracting during the creation and presenting of a presentation. A well put-together slideshow will be more effective than a poorly put-together Prezi. Prezi is a more closed system compared to another offline tool such as Google Slides. This makes it more difficult to download and present and to intergrate with other tools. Pros: Prezi is a power tool to make beautiful and dynamic presentations, featuring an original flow using mind maps and zooming. You don't have to be a pro user to make awesome presentations thanks to a clean and user friendly interface, in their business version, Prezi has some key features that worth to highlight. - There are several templates for every kind of presentation, it could be a product presentation, services breakdown, marketing strategies, and many other templates available and growing. - No need to install any software to display the presentations(however you can export a standalone Prezi executable for offline display). Cons: - Despite a polished and easy to use interface, at the beginning Prezi can be a little difficult to learn for the average user, especially is they are too used to work with Powerpoint. - Embedded videos wont work for offline presentations. - Despite several templates available, sometimes Prezi can feel unsuitable for some kind of companies with old fashion corporate environments. Pros: I like being able to create a presentation online as I can log into my Prezi account and work from anywhere. It is pretty intuitive to use and I like being able to pull images off the internet from the actual Prezi site itself instead of going to a search engine and finding what I want to copy and paste it in. You can get some really interesting presentations and are able to get pretty creative with it. While having all the transitions and amazing graphics, you'd might believe lots of effort was required to produce the presentation. The reality is that Prezi handles a lot of that and makes it easy for users to link slides and add transitions. I love using Prezi when I have ample time to create a presentation and when I am too lazy to make a template myself (Prezi templates are beautiful!). Cons: Prezi can be a little slow when loading but that is to be expected when it has to load and support many graphics and transitions. Also if you are looking to create a quick presentation, Prezi might not be suited for that instance. While there are many templates to choose from, you still have to edit all the elements and decide what you would want to keep or get rid of. It can be a bit fidgety at times, so if you are trying to use Prezi to churn out a last minute presentation, I would advise you to give yourself more time! Pros: Prezi is one of the softwares that differentiate our company from the rest when working in the oil business of our country. Powerpoint has always been the standard but prezi is everyday changing that fact, the content created with it feels completely fresh and dynamic, the presentations are not tedious and are presented in such a different way to what is accustomed. Cons: The big issue we have with prezi is that since it is not the standard for presentations our clients keep requiring us to use powerpoint, and if we want to use prezi we have to require them to install it which is not always accepted and requires for us to either install it for them or to recreate our presentations in powerpoint, both of which makes us lose a lot of time. Overall: Ever since we started using prezi we have noticed a large difference in our client's response to our presentations, they really love them and we are more and more migrating our efforts from the traditional presentation softwares to prezi, I really recommend it. Prezi - A great idea or headache? Pros: The best thing about prezi, hands down is it is more captivating than a powerpoint. The way it moves from slide to slide, and can zoom in and out for a big reveal is a lot of fun. If you're familiar with powerpoint, it should be somewhat easy to transition, and everything is straight forward for the most part. The support team is also really great -- I once over wrote an important project and they were able to get it back for me. Communication was fast and quick, and I am still grateful. If you can code or if you have a coder, you can add in your own code to make the Prezi presentation match your brand/business effortlessly. Cons: It revolves a lot of creative thinking to make a Prezi really shine, and it can easily give someone a headache or get dizzy if used incorrectly. It's easy to get lost in the pizazz of the effects and overkill your project. Some people just don't feel the need to put a lot of creative energy into a presentation, and I think is lacking on already built templates. I also think Prezi is better used for one off presentations, rather than multiple branded presentations. You also need to be connected to the internet to use this software, and even though we're almost always connected in some fashion, it can be inconvenient to not be able to build a presentation while being offline. Overall: We have impressed many clients by using Prezi. I think it is a great statement presentation, that will help keep presentation engagement. You can try Prezi for free, so you risk nothing by trying it ! 1.- You can give movement to your presentations and make them very attractive. 2.- In this version you can work as a team, so each one can contribute their ideas and modify them until they have a really amazing presentation. 3.- prezi in its different versions has preloaded templates, which are really good to start and give a new touch to your presentations. 4 .- you can pass your ppt files to prezi, you just have to upload the files, make a few clicks and go. 5.-all your prezi files are in the cloud, so it does not matter if they are not close to your personal pc, since you can access from any PC or laptop to continue working without problems. Cons: perhaps the only drawback is that at the beginning it may be a little difficult for your pressentation to be as you expect, but with some practice and after several presentations you will be able to handle yourself very well and place in your presentations everything your imagination wants. Overall: I used prezi some years ago, mainly to make presentations to my students, before I used ppt, but it was very flat and sometimes even for me it became boring, but with prezi things are very different, since with its effects of uploading , download, zoom, rotate and all the others you can do things that will undoubtedly attract the attention of your students. Pros: The presentations as previously known linear lack of color and movement have been left behind because this tool gave me the possibility to make my presentations more creative and novel since first they are not linear presentations if people want to navigate within the presentation what They can do it with full freedom, allowing movements that make people feel attracted when viewing the presentation and in addition to this you have the possibility to add videos, images and develop the themes through mental maps. Pros: The best tool to make presentations in my opinion, are perfect to call the attention of the public to which we are going, as it allows us to make presentations not like the traditional laminate by lamina, but more schematic with animations that do not bore and do not make heavy the presentation, one thing that I like very much about this tool is the amount of material from which you can start and how easy it is to present information under these schemes, besides the editing options are very simple and intuitive and end up being super fast and effective work with it. Cons: Speaking of the negative, I do not find much more than the fact that sometimes it can become slow to run the presentation if the hardware we are using is a little outdated, or the cost of using the tool since it must be paid monthly, also the use Internet is essential because to reproduce our presentations we need access to the Internet, but otherwise an excellent option to consider to present our information. Overall: It has been useful for both work and educational presentations, I have used it to present projects in my work and the truth is that it immediately captures the attention of the public that is watching me and I have also used it to make presentations in my studies. same, the tool allows you to create a presentation with a dynamic that forces people to be interested in what you speak or what shows. Prezi is PowerPoint on crack! Love it! Cons: Occasionally Prezi has updates that are not always intuitive But after a few minutes you're able to figure out exactly what you need to do to make your presentation. Pros: Prezi Business allows to create applications in equipment being faithful to the already known characteristics of Prezi with a dynamic and flexible format that pleases the users for the versatility of available themes and tools. Work teams can share files and folders to perform simultaneous activities and cloud storage is used, so that space is saved in the computers of the members. This software has a large number of creative and attractive templates that make these presentations a success with the public. Cons: In spite of being an excellent tool some of the limitations that it presents is that it is in English, it is also necessary to have a very good Internet connection. At the beginning it can be a little complicated to understand for inexperienced users but with a little practice they will be able to learn to use the tools fluently, it can also happen that the companies feel that the use of this program is complicated and therefore they prefer to use more software. Simple that does not require Internet access for its use and you can download the presentation in other formats, although this is not a disadvantage it really happens with several clients. Overall: For about three years I have used this software to make presentations for different audiences, what I have noticed is that creativity is essential to get the most out of it and as for the public Prezi is more accepted by younger generations as some companies and more people "Traditionalists" tend to resort to simpler formats such as PowerPoint, although that diminishes the showiness of their presentations only to be able to work without the need to install tools and without access to the Internet. Beautiful interface, incredible templates, Prezi business is the top XXI Century presentation tool. 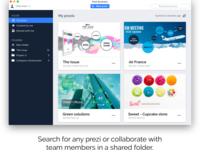 Pros: Prezi business offers young and experienced entrepreneurs, teachers and business people as well tons of visually-engaging features for making ground-braking visual presentations, no matter the field or topic. this software offers an intuitive and easy-to-get layout, fresh and simple to use, which ultimately allows both tech novices and experts as well on getting their points of views or observations attractive to audiences who are looking for both a satisfying and inspiring. Pro users have the chance of getting the most out of this product, with tons of online templates, useful tutorials and the permanent customer support that Prezi has always more than willing to offer. Getting the hand out of this tool will be a pleasant experience, one that surely make you want to go further and further with the stunning visuals and numerous options. Prezi business is the definite presentation tool for users who want to stun their viewers with more than just power point tools. The team is always trying to upgrade and add relevant features, and I truly do not think they are going to stop any sooner, keep up the good work. Cons: Having such a user-friendly and capable free version out there, people might find it a little hard to go further to obtain this payed version, as it could be considerably pricey for most. Overall: You are able to get tons of cool features and templates to complete ground-braking and stunningly beautiful presentations. Even though it might be a little too pricey, at the end of the day it worths it. Hard to learn, but worth it! Pros: This is an interactive way to present information instead of a boring and cliche linear representation of ideas. It's fun to zoom in and out and see the relationship between slides represented in their size. The layouts are numerous and exciting to use. You cannot even compare this to Powerpoint! It makes it look like old technology. It's a nice way to get my students to enjoy getting ready for their presentations by creating art! Students can create their prezi in so many ways. Cons: There is a very hard learning curve. It is difficult to get less technology save people to try it out and adopt it. It is also not available offline. You are not able to do it in a place without Wifi or if the wifi goes out. Many people like to practice with printed slides that they can take notes on, but this to my knowledge is not possible with Prezi. It is also nice in meeting to help others follow along with your presentations or to help them organize questions by slide since many presenters do not let you ask questions until the end. Some students will overuse some of the more interesting and interactive aspects which can give a presentation, no matter how well researched, a very unprofessional feel. Overall: We are soling the problem of having boring meetings that no one pays attention to. We would like to be able to present ideas in a fun way. We have realized that if you are a computer literate and tech save person, that you can create some amazing things. This is a fun product that I would recommend using. You need a lot of time to get used it though! This is not for last-minute reports if you want it to look professional! Pros: Zooming around frees you from the linear discourse that other presentation softwares dictate. You can create a virtual 3d world which reflects your mind and thinking style. But most importantly, you can make on the spot decisions as you present it to an audience; if you think that they are a little bored, you can skip some parts; if they are interested, then you can zoom into more details. This flexibility enables me tailor my lessons according to my students' responses. With other presentation software, I had to add bridges from slide to slide to gain the same effect but with prezi, don't have to think of the order that I am going to present so much. just decide what I want to tell, and put it in the space. Then, when the lesson begins, just keep asking students questions and zooming here and there as required. The same prezi, therefore, can be used with many levels and with many types of classes. Overall: I've been using the free version for educators. I've made 4 or 5 prezis most of which were for educational or academic purposes. I also used it once to prepare a birthday surprise for one of my friends. I used our photographs together and made a heart shape with them. In addition, I used it to advertise a piece of art by me. My purpose was to sell it online but I could not. Pros: Hands down Prezi helps you create some of the most beautiful and seamless presentations out there! There truly isn't better software for creating exciting and effective presentations that spark conversation with your audience. Cons: It is tough to learn! I am very tech savvy and was able to pick it up after about a week of daily use. However, I work with a team of people who are less than savvy and have had such a hard time learning to use it that they have given up and gone back to their old faithful. We sell Camping Memberships to our Family of RV Resorts and part of our pitch is having people attend a presentation. We have been using powerpoint for the past 15 years and we worked hard to create a new and exciting presentation. Because the learning curve was too difficult, our sales team abandoned using prezi and went back to powerpoint. Really sad! Overall: We truly love the beautiful presentations, but the learning curve has made it too difficult to implement with our entire team. innovative presentations, with small drawbacks. Pros: prezi offers the opportunity to do something different at the time of having to make presentations, since unlike the classic powerpoint, in prezi you can put movements, turns, place a phrase within a word or get close enough to the image of an eye to discover that there is another image or word inside it. its design is generally very nice and sober, has just what you need, and you can also see and make use of a tutorial of the company on what to do and how, and of course also how many with some templates ready to use. You can create an account and make use of prezi without the need to use your credit card, but of course, if you use the paid version they add other functionality (like being able to save a greater number of presentations) and you can use prezi and show your files without being connected to the internet. Cons: One of the difficulties that appear quickly is that if you want to make presentations with movements, jumps and turns, you should use a lot more time and dedication, since you must be sure of the sequences that you use, where you place everything so that it does not appear messily and of course, you should see that everything is as it should be. Another negative point of the program is that if you have the free option, because you are a student or you do not use it as much as you want to pay, you must always be connected to internte to be able to reproduce your presentations, which can lead to some problems if you have a bad signal . Pros: The freedom of orientation (turning the page, zooming, upside down, etc.) is great. The quality of the images is also really good and the end product usually has a nice, flashy, slick feel to it. Cons: Sometimes the software has a tendency to 'think for me' too much. It assumes I want a certain thing, and I can't convince it otherwise. Also, the new layer concept with different depths is beautiful, but I can't control how the background zooms with the layers. I'll place a frame over a certain part of the background in a way that I think looks good, but when the software zooms into that layer, I get a whole different part of the background in view. Often the placement of a frame will also change without my input. Overall: The reason I wouldn't recommend the software to everyone is that I think it's too complicated for a lot of people I know. Although the interface is, at first glance, pretty intuitive, a lot of people I know are used to PowerPoint, and I think it's too different in method for many people. I would definitely recommend it to creative people with a little digital know-how, however. Recommendations to other buyers: A great addition would be to incorporate the 'animation' options that PowerPoint offers to some degree. Sometimes having text or pictures appear in the frame after you've zoomed into would be better than viewing everything at once. For instance, in my last Prezi I wanted to show a picture, then have a red cross appear on top of it at my next mouse click ('crossing it out'). This didn't seem possible with the software. By the way, I've had no contact with customer service and, as a current student, didn't pay for the software, so the five star rating there is simply to reflect my indifference. Tip for capterra! Allow me to say 'not applicable'! Prezi Business is the most advance and efficient tool for professional presentations. Pros: Prezi Business comes with the most advance way of making presentation slides. We can choose from several of modern templates and designs and can implement them in our slides. We can also easily arrange the content and can add attachments too. Gaining the access to the account is also very much easy and reliable. We have already improved the way we present our products and services to the clients and the employees. It has enabled us to take a step forward easy preparation of presentation with minimal efforts. Cons: With Prezi , I've encountered few issues which includes difficult user-interface and hard to implement designs and expensive templates. Thus , a simple basic user can't even use it properly. It's really hard and time-taking to implement all the features and the additive tools. Prezi for Business is also somehow quite expensive . But all the features and qualities of this tool are worth each and every penny. Overall: With Prezi , I can make professional presentations with eye-catching content. It enables me to represent the services in an efficient way and gains the trust of the audience in most reliable way. Pros: I used Prezi only a few times. However, it's perfect if you want something special. Maybe it's someone's birthday or a company party. Prezi definitely has a lot more functionality than any other presentation tool. Special effects, animations, and etc. Prezi is full of such features. Also, you can find lots of various templates for a nice Prezi presentation. On PowerPoint, it's a bit hard to find them, however on Prezi everything is right there. Prezi definitely helped me a few times to make my presenations more engaging and alive. It's not a tool I use for day-to-day presentations. It's made for special occasions and it's perfect for that. Cons: If you'd compare it to PowerPoint or other presentation tools, Prezi is a bit more difficult. Sure, you get more functionality, so that's the price for it, but if you want something quick, you should use Prezi's templates or even another tool. Overall: Prezi is a perfect tool for less official presentation. It will make your audience feel alive, you will notice higher engagement because you never know what's next when you open that Prezi presentation. I use it very rarely, but when I do, I'm definitely satisfied. Pros: We used Prezi in my former company almost exclusively, to get away from the drab continued use of PPT. In a highly competitive sales environment, Prezi enabled us to stand out with dynamic presentations that looked like we had very experienced animators on our team. Once we began using Prezi, we used it not only in our live presentations, but also our printed materials and even extended it to our tradeshow presence through digital signage, It was eye-catching, and full of surprise and delight. Cons: This is web-based software, so until we learned to save it in a certain format, it would sometimes cut out. To present seamlessly, be sure to save it properly to the device so that it can be presented offline. Prezi, Easy to Use, Anytime, Anywhere and Anyway! Pros: Whenever I prepare a business presentation, I could not think of any software but Prezi. I found Prezi as a presentation software tool that compliments my personality - fabulous, accessible and portable - anytime, anywhere and anyway. Prezi makes my presentation available around the globe and seamlessly provides interactive effects to the viewers. Cons: Nothing compares Prezi! I love everything that Prezi offers! Try it and you will get hook into it! Overall: When I first used it, my audience got amazed and they are like, oh there is a software like that? And so, I have no problem anymore on how to catch the attention of my viewers. It builds my confidence whenever I have presentation in Prezi and it looks like my presentation was designed by professional multimedia artist. Pros: We often use this software when preparing presentations about policing, the steps involved in becoming a police officer and the different departments of it. The unique and eye-catching format of Prezi keeps youth engaged. It still offers a professional look. I like how it is a single canvas (rather than separate slides) and shows a visual outline of the whole presentation and zooms into the content. There are several templates which suit any type of presentation/topic. The presentation looks extremely well done and looks as if a lot of effort was put into the product. Prezi gives visual presentations more room for creativity than a traditional powerpoint. What is also great is that no software needs to be downloaded to use Prezi, and your presentation can be accessed by simply logging in through any compatible device. Cons: Prezi can be very confusing and frustrating to use for new users. Once you get used to the setup and features, it is fast and easy, however, when you first use it, it seems complicated. Embedded videos do not work for offline presentations, so if you don't have access to wifi, your presentation will not work properly. Pros: Presentations are more creative. I believe the company has said Prezi's make it easier to learn based on some studies but see their website for that information. The audience normally is exited to see something new and seem to like to see and Prezi's more. The presentations may look complicated, however you could use some of the standard ones and just add your information. Cons: While it is easy to learn, people not familiar with basic computer programs my take time to learn. Creating presentations (good ones anyway) take more time. It is not just copy and past of information. Overall: So Prezi is a fancy word for Presentation but really it is a software that helps you present information. I used it from 2010-2012 and I am sure some things have changed however the the essence of the soft ware is the same. You can make great presentations. Much better than power point. You create a map of information and then go over parts of the map. The map can be anything. I urge anyone to see some of their sample presentations. If you do not have a lot of people/number of presentations/ or if your presentations are short then you are find using power point or anything really. However if you are in a business that has presentations often/ longer presentations, and/or larger groups it is my opinion that Prezi is worth it. It keeps people engaged and overall does a better job than the slide after slide of power point. Recommendations to other buyers: Same as above, if you do a lot of presentations, or long presentations this is something you want to use. Or at least to a trial and decide for yourself. Pros: We use Prezi for big presentations to management and key clients, mainly due to the importance of impressing our stakeholders with the fancy animations and the way we present our data. And we actually got four prospects emailing us right after our pitches to praise the decks we presented, and how they felt the fluid animations Prezi allowed us to show was a breath of fresh air compared to our competitors who presented ordinary PowerPoint presentations. - Smooth animations - Data representation - Utilizing a single canvas with the zoom in/out features creates a magical feeling to the presentation. Pros: There are a large variety of themes available. In fact, I have chosen a different theme for each presentation I have created. I select themes that metaphorically or in some other way convey the specific message of the presentation. Sometimes I will add slides into a circle pattern so that as we progress through the presentation we come back around to the beginning. Cons: The only con (and this is also a positive) is the presentation moves. My technique is to add slides next to each other so that the movement is small. If you go across the whole screen to the next slide, it can give the audience a feeling of seasickness. Overall: I have created several presentations using Prezi just the free version. The first presentation had a little learning curve as I figured out which theme to use and how to add "slides". I practiced the presentation a couple of times and then delivered it in front of about 50 people. The response was very positive. People liked the style of the presentation and found it easy to follow. Also, Prezi is much more interesting to watch than a traditional power point. Since then I have created several Prezi presentations. Every time the audience asks about the software and mention how much fun it was. Using a free plugin I have also embedded the presentations on blog posts for my business website, like you would a You Tube video. Site visitors can review the presentations and read my notes at anytime. Prezi has helped my business grow while helping educate the public and my clients. Recommendations to other buyers: Use it and enjoy it. Pros: Prezi really allows the user to make a complex presentation with a lot of graphics, effects, and transitions. The presentations look very professional and complex, but the templates allow most of the graphic work and transitions to be done by the software. The user just needs to enter in their content and boom...deluxe presentation. Cons: I think that Prezi has come a long way with their more user friendly, helpful hints on how to work the software, but I still think it is more complex than Powerpoint. It isn't as easy to understand for first time users or people who do not have a lot of computer knowledge. Overall: Prezi really allows the user to make a complex presentation with a lot of graphics, effects, and transitions. The presentations look very professional and complex, but the templates allow most of the graphic work and transitions to be done by the software. The user just needs to enter in their content and boom...deluxe presentation. This is really good for students that are doing a presentation to their class and want to not just have a normal basic powerpoint. Overall: Love this software I use it for all of my presentations and BYOD classrooms. It would be great to have a better capacity for clips and other more interactive features. I often make a template presentation as a lesson and share it with students to have interactive and collaborative learning as well as differentiated learning and have them send it back to me. Sometimes prezi can be slow or not load properly wich is a bit of a pain. I use it offline when overseas for presentations as well. Awesome! That's the first word I can think when I'm working with Prezi. Just awesome!!! Pros: What I like most about Prezi is definitely the fact that I can make so dynamic and fun my presentations with such a ease, just zoom in and out and you just create especial presentations that capture people attention instantly and in the things you want them to be with just zooming in to a word, number, image or video. Cons: The thing that I like the least is probably the fact that I can't work with vector data like SVG, apart from that I love Prezi and I will keep using it for many more amazing presentations. Overall: The fact that i can make presentations the way I truly want. Pros: Prezi is an online application to make presentations that differ from other Software because it is used and the slides are assembled in a non-linear, different and innovative way. - The free version of the web application has a series of pre-established templates, which have very attractive designs. - It is not necessary to pass by slide to get the sheet that we want to show, by just zooming in we can locate it. - You can add photos and videos. In addition, it is very versatile for its use of titles and subtitles that end up giving a versatile view of the presentation. - It can be used online, in the cloud, without having to install a program on your PC. Cons: There are features that I do not know about the application because they can only be used in the subscription version. - If you do not have a good Internet connection, the presentation may be slow. - I, in particular, took the computer where I made the presentation because I am afraid that I will lose the configuration. Overall: I have used it to surprise my team and the senior managers of my company to show the annual communications planning. Offers engaging visuals and animations can really grab an audience attention. Pros: Prezi's take on presentations is very different, since it does away with slide decks altogether in favour of a massive canvas. Cram it full of all your pertinent info, lock off views representing the most important areas, then zoom, twist, reveal and jump between them for a truly dynamic presentation. Make slick, dynamic presentations without traditional slides. Cons: Doesn't support PowerPoint files. Presentations are public by default, presumably to discourage business users from exploiting the tool without paying for it. Many people, faced with Prezi's sometimes unpredictable movements, find themselves becoming somewhat seasick when watching particularly active presentations. Be careful with your movements, and watch a few of the advice videos on Prezi's site so you're sure you're doing it right. Overall: Got me a way to made a presentation using software that offers engaging visuals and animations, that can really grab an audience's attention, get them engaged, and make sure they actually remember the information. Pros: My favorite thing about Prezi can be summed up in one word... Versatile. Prezi allows me as a sales content manager to create sales presentations that can follow a flow much like a Microsoft PowerPoint but also gives you the versatility to jump around. For example, say I have 5 products in my portfolio. A, B, C, D, and E. This allows me or another salesperson to present in a versatile manner; say the presentation and discussion takes a turn and the audience wants more information on product C, instead of scrolling through a list of slides to reach your destination, Prezi allows you to jump around and immediately find product C.
One of the most obvious things that I like most about Prezi is that it looks appetizing to audiences everywhere. The unique feel makes for an incredible feel, that is different from most of our competition. Overall I would recommend Prezi to anyone looking to differentiate themselves from their competition. Cons: The biggest downside about Prezi is the steep learning curve. I would call myself an apt millennial, who normally has an easy time picking up most programs quickly. Once you figure it out a few necessary building blocks, the possibilities are endless. These are both problems for me and the salespeople I make them for who are generally from an older generation and change is taboo, although after showing them the differentiation and creative possibilities, they are normally open to working with it. Overall: Differentiation from the competition, a unique look, and a versatile functionality. Pros: First time I used Prezi was during my bible sharing with a group. I have not much time to design my slide but with Prezi, I was able to create an engaging, persuasive, beautiful presentation in less than 30 minutes. There are lots of pre-defined templates or slides that will suit your needs, depending on the focal of your discussion - sales pitch, business presentation, project goals/objectives, school project, presentation for family gathering. It is definitely designed for people who are not great designer, always on the go and got no time to think about how to beautify their presentation. 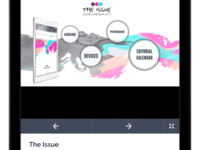 The navigation is great that you can jump to different section without flipping though slides. I also love the way it tracks the progress. Cons: Almost no cons for this software. If something, maybe it would be just how slow the computer can turn when you've added lots of slide, but that mostly depends on the ability of the PC as well. Overall: It takes my presentation to the next level! Pros: Prezi is changing the way presentations are made, they are so much more dynamic and interesting when compared to the usual presentations created with other softwares such as powerpoint. They allow you to differentiate yourself from the rest of companies who are extremely rigid in changing the way they usually work. Cons: One major con that prezi has is that since almost everybody uses powerpoint they normally ask you to make your presentations with said software. Overall: Once people realice all of the benefits that prezi presents I'm sure there will be a huge migration to this software, it is just incredible and it really makes your presentations shine without a large amount of effort since it is so intuitive, I absolutely recommend it. Pros: What I liked most about this software is that it allows me to make presentations in an organized, interactive and creative way since it has a wide gallery of templates. If you need help to use it, you can rely on tutorials and articles that allow you to learn how to use this tool. It allows you to use pdf files, images, maps and multimedia resources. 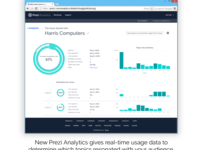 Presentations can be stored in the cloud and on your own desktop. You can share the presentation on the network and publish on social networks. Cons: What I liked least about this software is that at the beginning of its use it can be somewhat complicated to understand it because its format is not the traditional one to which we are accustomed (linear). And the other thing that I did not like is that it is not free because being a business program it is sold for teams of ten people and the price is usually very variable because it comes with service packages. Overall: My experience has been very profitable since it has allowed me to present and communicate my ideas in a visual, organized, structured and dynamic way. Thanks to this I have managed to capture the attention of people since the information is displayed in a visual, attractive and convenient way and this impacts the audience since it is impressive. Pros: Ever heard of the term "death by powerpoint"? Prezi solves this by making our presentations more appealing to the audience. The animation is super smooth, and I love the ability to zoom-in a part, rotate, pan, and then zoom-out to show the big picture. For me, it works very well to help drive the point. I've used Prezi personal since several years ago, and in comparison, Prezi Business seems more streamlined and simple to use. And, with the Business subscription, you get to work on Prezi projects as a team. A motivation for us is the feature called Company Leaderboard which basically shows which Prezi projects are more effective (i.e., most viewed). Cons: It would take a change of mindset and a release of creativity to use and design your own Prezi's. As can be expected, the older users may find this novelty to childish or complicated for them. We have had some difficulty with deployment to older staff, but the younger generations adapted to it so easily. Overall: Prezi is great for teachers (to effectively engage Gen Z students), sales and marketing people, or basically, anyone who wants to make a more engaging and interactive talk/presentation material. ideal to make presentations of research papers. Pros: It has a large number of ready-made themes, loaded on the website, which you can use as a basis for your presentations, you just have to find the one that fits your needs and what you want to explain, in addition to this it is easy and fast management, you do not need an additional course to be able to use the program. Cons: is that in some cases is too heavy and if you have a good computer with a good RAM, the presentation that you are doing is stuck and you can not see it with good fluency. You must necessarily have internet to be able to see the presentation. Overall: the biggest benefit is that you do not need to download the presentation to store it on a storage device, since you can access it from any computer anywhere in the world, you only need to register on the prezi website and ready you have all the information you have saved there available. Pros: Prezi allows me to create modern looking and design appealing presentations that will keep the audience engaged like never before with standard PowerPoint presentations. If you play a little with Prezi you can create amazing presentations with animations like a pro. Your text can appear from nowhere and you can use zoom in effects to reveal text that is well hidden at first look but this can actually be a very good slide transition. What is the best about it is that all your presentations are automatically synced in a cloud and you no longer have to worry about whether PowerPoint is or will be installed on a presenter computer? You no longer need a USB stick, you just open your presentation link and you are ready to go! Cons: I was using offline Prezi editor and it was always giving me some technical errors. I thought it would be performing with better performance when a lot of effects are applied but in fact, it did the worse job. I recommend everyone to use the standard web editor because of that unpleasant experience. Overall: All presentations should be made in Prezi and you can do that very simple by converting your old fashioned .ppt or .pptx to modern online Prezi. Pros: To be completely honest I like everything about Prezi, the way you can play with you information and make truly amazing, interactive and attractive presentations with such ease is just awesome. Cons: The only thing I can say that I like the least is the exporting options, prezi should include other formats and options to export and present. Overall: Working with prezi has been great, I created plenty of amazing presentation with it an I has become my primary option for presenting information. - has a lot of "movements" and "motion"
Overall: Prezi is a very creative tool. We are an IT program, so us using it during our presentations always impresses students (saying that we are staying up-to-date with technologies). Its functionality is limited (if you compare it with PowerPoint). Also, it is very important to structure your presentation in Prezi correctly; otherwise, it make become very unstructured or not deliver and/or confuse your intentional message. Pros: I like the way the end presentation looks. Cons: I think it is difficult and cumbersome to work with, however, if you have some time to play with it, you might be well pleased with the software. Overall: I have used Prezi off and on over the past several years. I really like the presentations you can create with the software. However, in my opinion, it is hard to manipulate and the setup of the GUI makes it difficult to move things exactly where you need them if you need to veer away, even slightly, from their templates. Prezi is very visually stimulating, though. I would recommend checking Prezi out if you are concerned about the graphics and visuals of your presentation. Also, it becomes a bit difficult to add large amounts of data if that is something you need to do in your presentation. Overall, check Prezi out with the free version and see if you like it. Personally, I tend to only use this for small class visuals as statistics presentations or blocks are hard to manipulate in Prezi. You just have to weigh what is most important to you and your needs and if you have the time to get the data to look how you want it in Prezi if you do your efforts will be rewarded with a great presentation. Recommendations to other buyers: Check it out if you have short presentations with only a few pieces, if you have a lot of pieces you might want to consider all of the options for software as well as how much time you have to work on moving the pieces around if you decide to go with Prezi. Pros: Its ease-of-use and customization. Cons: On a couple of occasions, my work computer's software needed upgrading (which is sometimes beyond my control) & it prevents me from editing existing/creating new slideshows. Overall: As an educator, I need to have engaging visuals for my students (they're middle schoolers). Prezi fits the bill in every possible way. Customizable presentations in which you can easily insert music, videos, & more keep my classes focused and attentive and even some of the "driest" subjects. I love Prezi! Recommendations to other buyers: Get it; use it. You will not be sorry. Pros: Prezi offers a UI/UX like nothing else. It redefines the software presentation category (like the car did for transportation). The ability to drill down and easily move around the presentation 'board' just makes sense - simply intuitive. Easily include all sorts of content. Online and offline tools are available. Reminds me if the advancement the CD was to audio tapes. Cons: Haven't found anything I needed or wanted that it doesn't have or can't do. Once you realize the complete change in presenting this offers, you'll never turn back. Powerpoint may be the standard (so far), but even the typewriter eventually got replaced once enough people 'saw the light'. Overall: Most importantly, getting your point across in an interesting, almost exciting way that promotes remembering the content (think movies over slides). Pros: The configuration of the workspace seems to me excellent, the use of the zoom options gives a lot of freedom to the presentations and I like the tools to create the graphics through data and also to be able to insert high quality images or high resolution videos which leads to a very advanced result in the design of the presentations for projects. Cons: Some presentation and creation options are very basic, the collaboration chat is simple and rigid does not allow more functions than chat communication which limits the process of exchange of ideas to improve the presentation, Prezi Analytics is very interesting but still lack of development to cover the expectations. Overall: It really is a nice software, easy to implement and also very creative and professional, create presentations of architectural projects where you can also add videos and high resolution images and graphics allows me to concentrate all the information I need to expose in a single presentation with a very positive. Pros: I like the Prezi gives the user different layouts and ways to present information in a way that is fresh and new and also inviting to the audience. The ability to zoom in further and further during a presentation gives the user the ability to really customize their presentation and gives the audience a "what's next" sort of experience. Cons: I actually emailed with their support team and asked if there was a way to slow down the motion for some of the templates as some of our execs were complaining that it was giving them motion sickness. It would also be nice to be able to drop in a flat slide really quick (possibly like PPT) if you need to just put something together fast and don't want all of the motion that comes with a lot of the templates/layouts. Pros: Many times I used to think that an application to generate presentations of work should be sober and perhaps even boring, but Prezi has shown me the opposite, a few weeks ago I started using the free version and I have obtained products of quality and great aesthetic value. I understood that I can create fun ways to present my work, avoiding the monotonous ways I have been working to present my results. Prezi offers multiple templates that serve as guides and fonts to customize the results, I am delighted with the tool and recommend it 100%. Cons: I wish there were more free templates to generate better presentations. Because of this limitation I can't make a decision to buy it or not. A tool capable of advancing the quality of digital presentations. Pros: Its implementation is certainly very simple, making its deployment and learning is very intuitive and graphic and that is valued positively, the tools for collaboration and teamwork work optimally allowing comments to be made in the presentation that must be adjusted or improved, I like his interactive ability since the presentation is more creative and dynamic. Cons: The graphics area is still weak, needs more complex and professional templates that are able to connect to generate more visual analysis and synthesis, some templates seem monotonous and simple, does not have an external library to expand the available tools. Overall: Significantly improves the quality of the presentations and the time of development invested in its creation, I am pleased that it has Prezi Analytics to understand the impact that the presentation presented to the users, in summary it is very efficient for a creative work area where I must constantly make very visual and dynamic presentations.